Sonic the Comic #223 is the two-hundredth and twenty-third issue of the Sonic the Comic series by Fleetway Editions Ltd. This is the final issue of STC, marked by a two-page editorial by Nigel Kitching that talks about the history of his work, which was initially set to appear in issue #200. 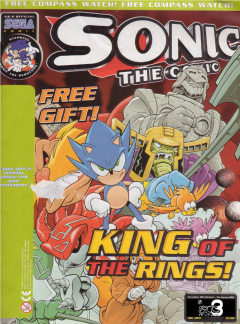 The editorial also covers his first stories including the Sonic CD and Sonic 3 & Knuckles story arcs, as well as post-#100 creations like the Drakon Empire and the death of Johnny Lightfoot. Like all issues since #184, there are no new stories; this issue merely collates the 4-part "The Evil Empire" comic originally printed in 1997. Although this list is extensive, not all staff members were credited. Jim Alexander missed out from the writing credits, but only penned one story. Steve White is the highest-profile artist omission and Annie Parkhouse is not listed for her single story. Several more editorial team members missed out on a place in the final issue, notably Andy Diggle. This page was last edited on 18 March 2019, at 17:58.